Opening up a bicycle showroom here, and that too a second one, may seem to be a retrograde step in an era where youths are enamoured by the variety of sleek and sturdy motorcycle brands which reflect their machismo. But Joyon Bordoloi and Angshuman Baruah, beg to differ and have decided to go for the track and trail less travelled. Joyon, who had opened Pedal Street, a cycle shop, last year, joined hands with Angshuman to open a Track and Trail store near Elite Gas Agency here. While former AAU professor Tapan Dutta and advocate Rintu Goswami did the honors at the inauguration on Saturday it was stunts by cycle stuntman Deepjyoti from Guwahati who drew the attention of the crowds today. 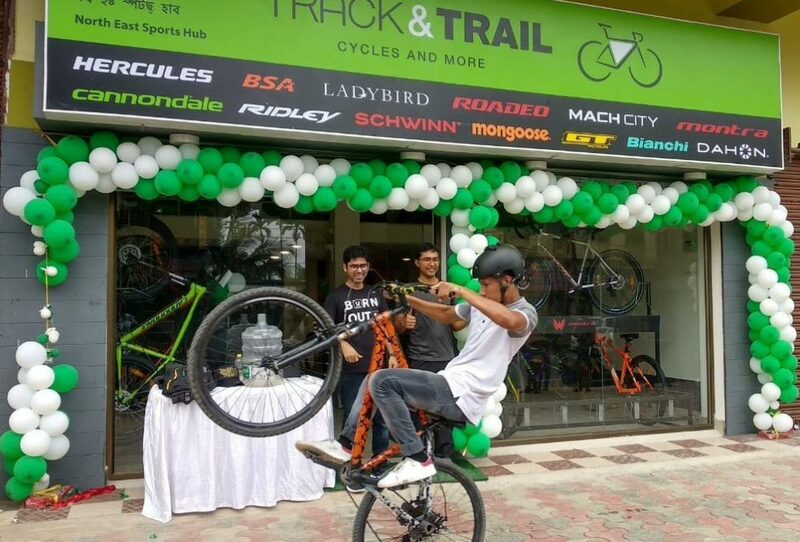 Track and Trail is a franchisee chain of TI Cycles which offers such brands as BSA, Hercules, Mach City, Montra and an international range of bikes. “We are the second Track and Trail outlet after Guwahati in Assam and are sure that the youth are going to take to the international brands like Huffy from the USA, Giant from Taiwan and Canon Dale. For those not in the know a Huffy could cost anything from 22000 onwards and a Giant could cost as much as Rs 12 lakh. “These cycles, mostly used by Olympians have gears and a smoothness and speed which need to be experienced to be understood,” Joyon said. Cycling is the latest trend in the fitness mantra, he further said. More than 200 cyclists had participated in the Bicycle rally organized by Dikh on World Cycling Day on June 3. Earlier rallies by Dikh had also witnessed a good turnout indicating that the youth here were taking to cycling once again. In fact Joyon had met Angshuman, an engineer, on one such cycling expedition. Joyon, who is confident about the success of the store located in the midst showrooms displaying popular motorcycle brands said that he had known of one person who had given up a Bullet and take to a cycle. “Cycling is not just for fitness and for those who would like to promote cycles as a clean, green mode of transport but also an international sport,” he said. In this context he and Angshuman have floated a company, The North East Sports Hub and this is their first venture. “We will probably open a showroom on sports goods and accessories next and also promote such sports as basketball and skating. Probably an indoor stadium could be made where these could be taught. There are a lot of plans” he said.